Love them or hate them, those cute but deadly furry creatures on the forest moon of Endor can be found in many collections. 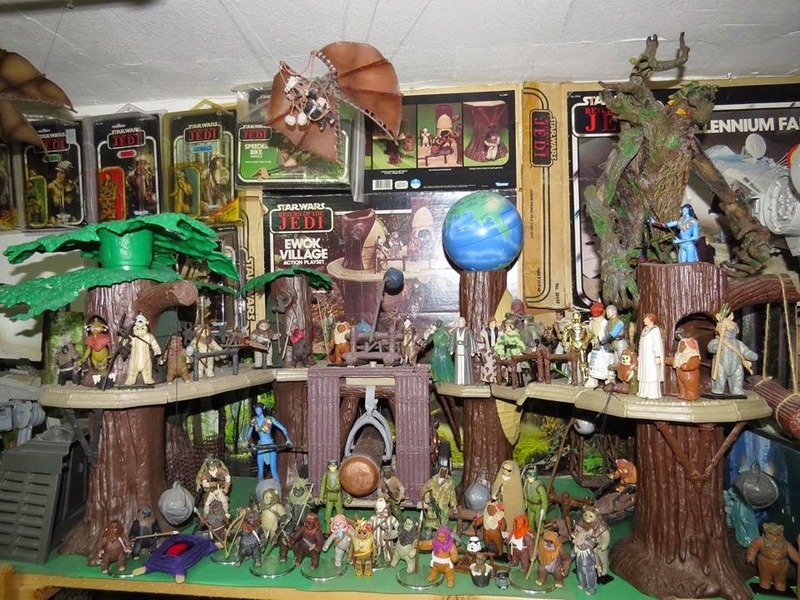 It's likely some of you grew up playing with the Ewok village straight out of the box as my brother did. Today, as collectors we display these plastic tree playsets with pride. This display by Tom Stewart includes some Lego pieces in addition to other vintage items such as this Ewok village presto magix board as a backdrop. A swath of AstroTurf completes the look. 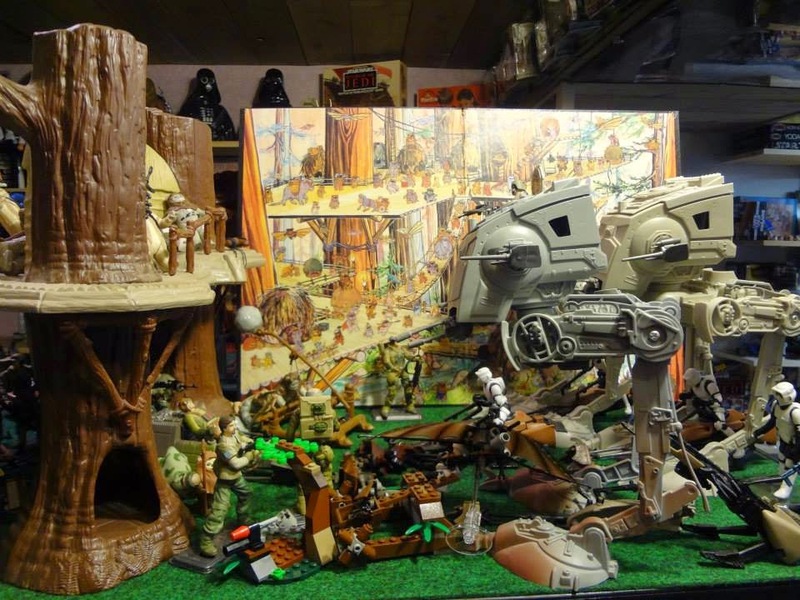 If you find yourself stopping by Toy Traders in Langley, B.C., Canada you'll find this alternate take on the battle on Endor. 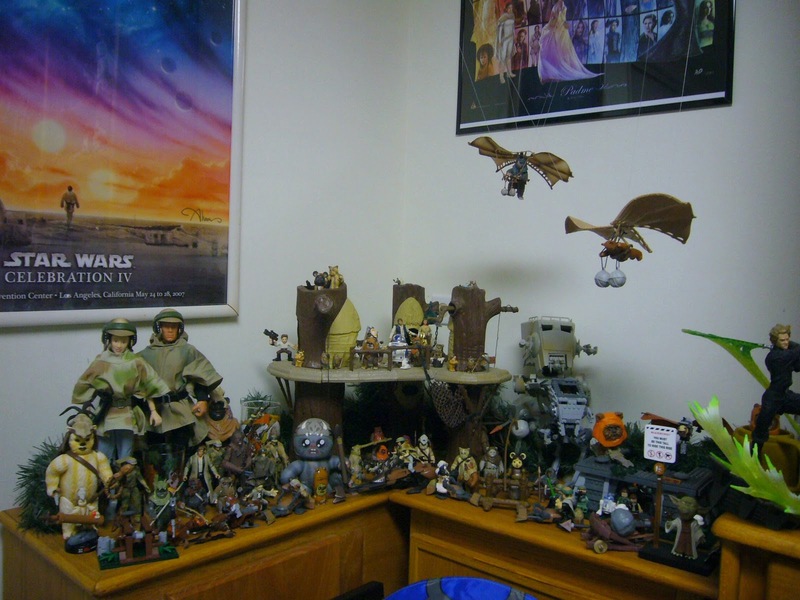 This display incorporates pieces from several Ewok villages and action figures from the vintage to the modern lines. During the holidays I add some lighting to the village. A lit holiday garland and some battery operated red LED lights inserted in the fire pit hole make the village interesting at night or by day. 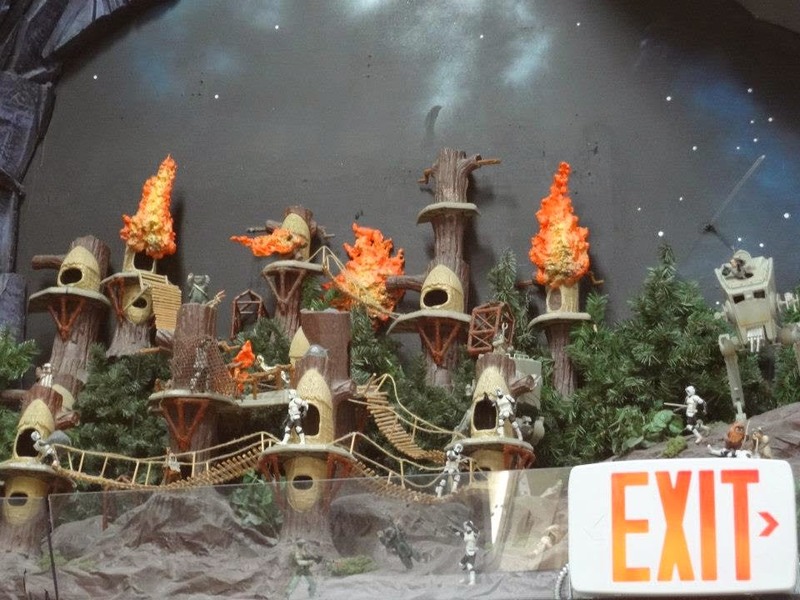 A real mix up, this is one of my earliest displays of the Ewok village using as many Endor figures as I could find across a variety of licensees. This is a display from the Washington State fair, 2014. 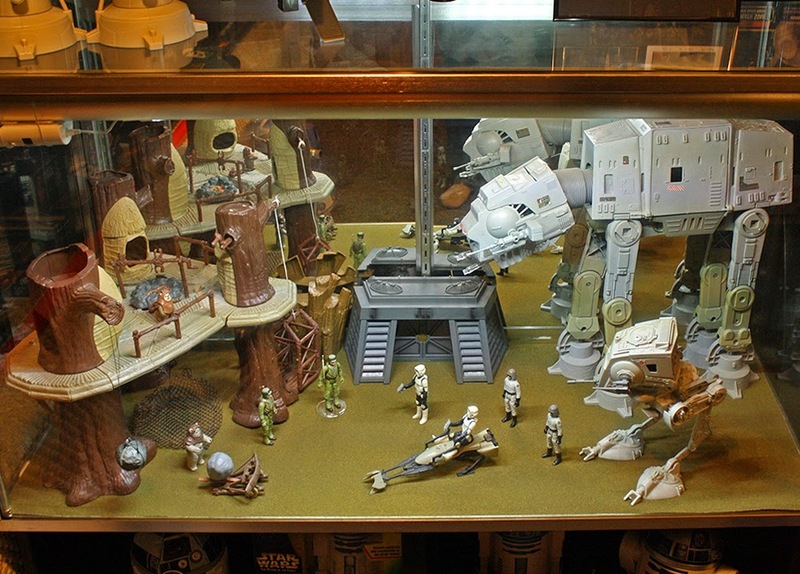 It's a great blend of ROTJ with Ewoks collectibles. Note the wonderfully vintage Ewok family portrait in the upper left corner. 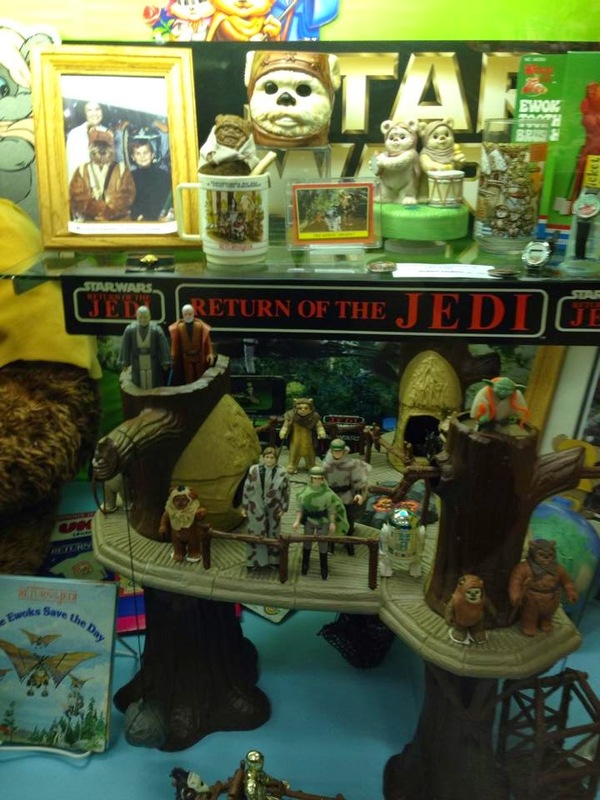 Sam Williamson's Ewok display has doubled with his addition of the Kenner Robin Hood village and other forest guests. Kenner recycled the Ewok village mold when they made the Robin Hood line. The foliage is a nice addition to otherwise bare Ewok tree trunks. Using mainly vintage items, Curt Hanks has created a scene that puts the 1983 Sears catalog to shame. Have collecting topics or pictures you would like to see? Please leave a comment below. The last pic is great. Clean lines and cool display! Stephane Faucourt's "La French Touch"